Running Past is a follower of things that aren’t always obvious to see – this has included often submerged streams, and a few years ago traced the route of the Greenwich Meridian back to the Observatory from the London border in New Addington. The Greenwich Park Branch Line is a long closed and largely forgotten railway line in south east London. However, I attempted to follow the route to see what remains of a line that mainly closed in 1917, ‘armed’ only with Victorian Ordnance Survey maps to guide me. First the history – the railway was a relatively short lived one, built by the London, Chatham and Dover Railway from and existing junction at Nunhead to Greenwich Park. The original plan was for the branch to terminate at Woolwich Dockyard, but this idea was quickly abandoned, and there were serious problems getting funding for the section from Blackheath Hill to Greenwich – the former opened with the rest of the line in 1871 (apart from Brockley Lane station which opened in 1872) but passengers had to wait another 17 years to reach Greenwich Park, which makes some of the current delays on South Eastern seem almost acceptable. The unmarked station can be seen at the top right hand corner of the map above. The line was never a financial success, journeys into central London were much slower than from Greenwich and changes often being needed at Nunhead. The line closed in early 1917 due war time financial savings. It never fully re-opened. The section beyond the main line into London Bridge, near St Johns, was re-opened and connected to the main line in 1929, the stations never re-opened though and the section to the north and east between Lewisham and Greenwich had tracks removed and was largely abandoned until after the Second World War when it was gradually developed. The terminus as the line’s names suggests was close to the Greenwich Park, in Stockwell Street, it opened much later than the rest of the line in 1888. The site is now home to the Ibis Hotel which opened in 1988. 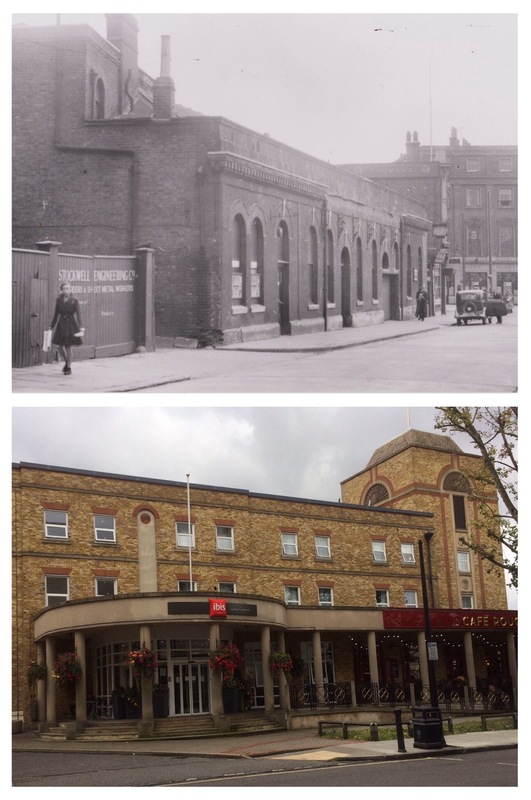 The platforms are now home to a car park and the buildings edging the former station now house the Greenwich Picturehouse which is from the same era as the hotel. ‘canopied……built of yellow brick, with segmental arches above doors and windows picked out in red. Adjoining the booking hall was a buffet, and first and second class ladies’ rooms, a two storey house was provided as a home for the Station Master. Like much of the rest of the early part of the line, the station was in a cutting.as the levels below show. After closure, the buildings remained, used first by the Mayfield Temperance Billiard Club and later a timber yard and saw mill. Other than the footprint of the hotel and the car park, there is nothing to see in terms of remains of the station. While there are several large chunks of masonry at the western edge of the car park, sadly none seem to be remnants of the station; signs suggest that they all relate to workshops for the blind which seem to have been adjacent to station buildings on Greenwich High Road, formerly London Street. This was close to the business location of Edmund Pook who was (probably) wrongly implicated in the Eltham Murder in 1871. While the line effectively closed in 1917, the route is relatively easy to pick out in Greenwich, the gaps between buildings with 20th and 21st century infill between Victorian properties make its course clear. Out of the car park, the route across Burney Street is easy to spot; there is the now former Police Station on the corner of Royal Hill and the Burney Street Garden which would have been on the route. The railway was bridged by Royal Hill at this point; the usually reliable Edith’s Streets suggests that there are some remains of the bridge, but alas dear reader, they proved impossible to find. The next section, though, is easy to spot – there is a long site where there are periodically notices of planning applications which are then turned down by Greenwich Council. 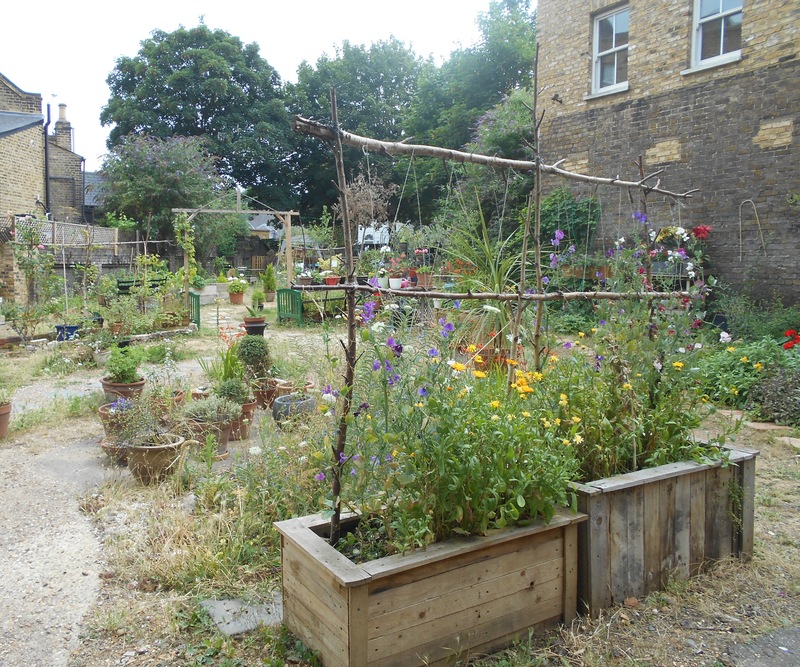 It is currently home to the delightful Royal Hill Community Garden, pictured above. 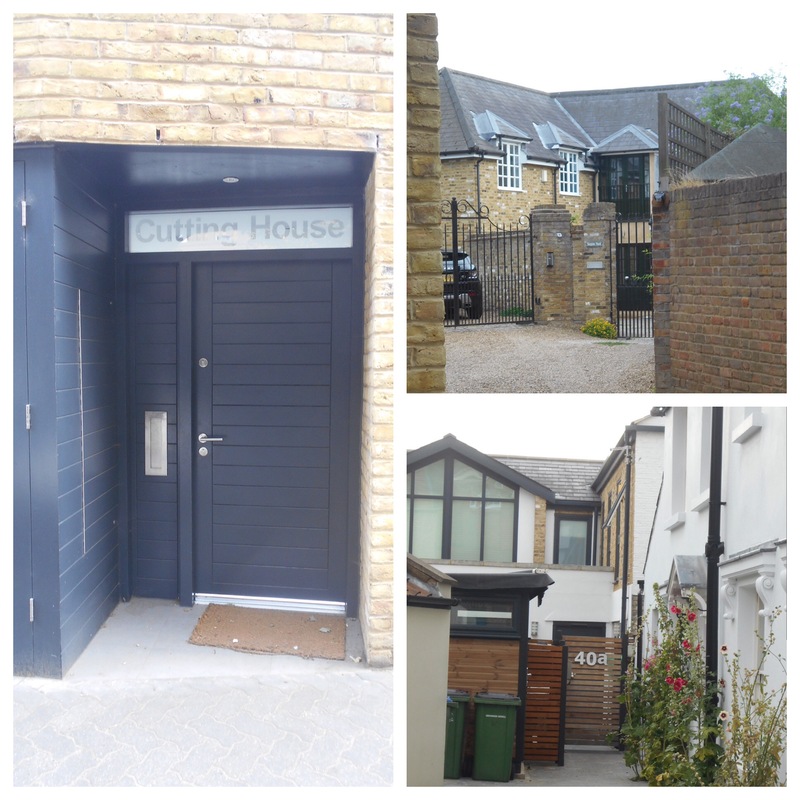 The railway used to run almost parallel to Royal Hill and its former route continues to be clear as it crosses Circus Street – where a modern infill development, which includes the appropriately named Cutting House, partially fills the vacated space. 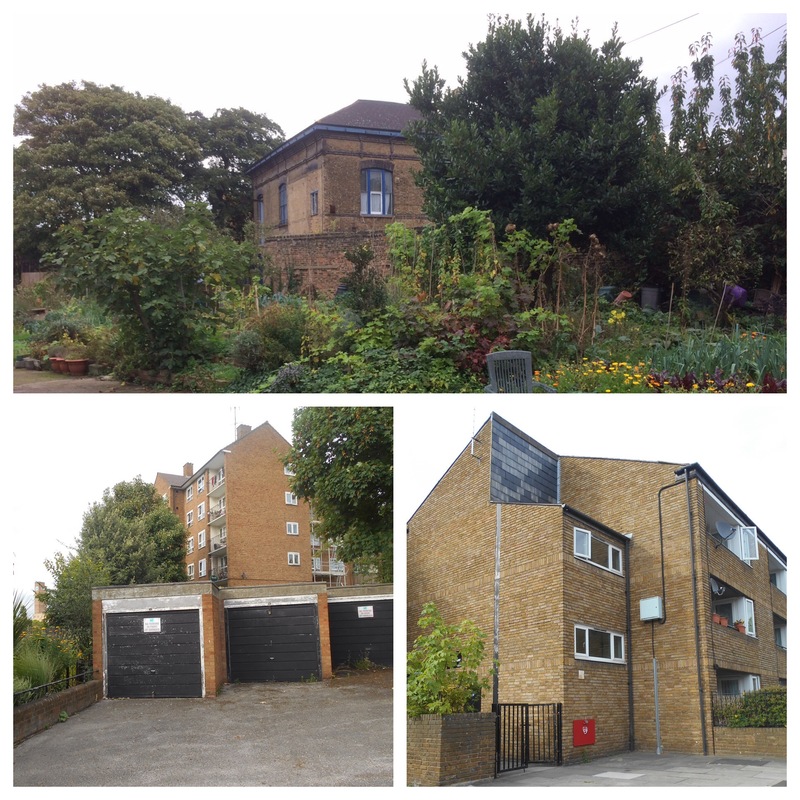 The theme of communal cultivation continues beyond Circus Street with the Prior Street allotments filling the void left by the railway. There was a level crossing at this point. As Royal Hill turns sharply back towards the High Road, a post war council block, Topham House, and its garages fill the space left by the departed steam trains. Jervis Court is the next addition to the Greenwich streetscape – a thin block, barely as wide as the tracks that were its predecessor. 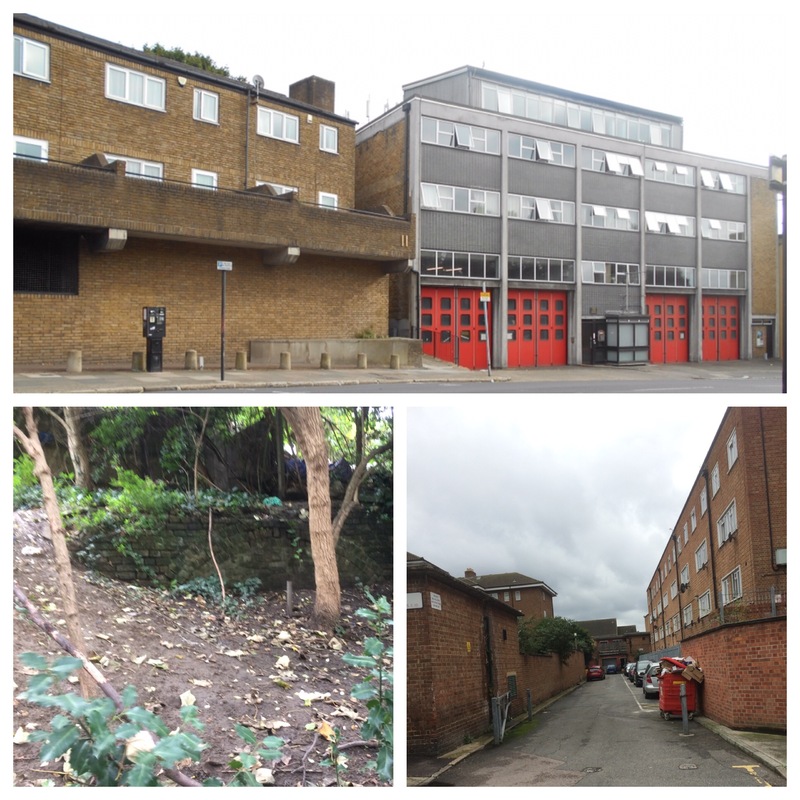 The line swung under Blissett Street, its cutting now filled and on the surface an imposing deck access block built into the hillside next to a 1970s fire station. The railway was in a cutting here as it skirted the foot of Blackheath Hill, while it was filled in, two ‘signs’ of it remain. A scramble across a small bit of waste ground reveals some of the cutting wall and back at ground level, next to a basketball and football ‘cage’ that sits atop the former railway, is a bridge weight limit sign, for a bridge that is no longer visible in Lindsell Street, the gap it crossed no longer there but the restriction still applies, presumably due to difficulties of compacting the fill for the cutting. Apparently the void can be reached from the adjacent fire station and the the fire brigade use(d) the area for training, filling it with smoke. Beyond the ghost bridge, the erstwhile track has been covered by an access road to the postwar council flats of Plumbridge Street and Dabin Close. The smoke and steam from the trains may have long gone but pollution remains as diesel lorries and cars toil up Blackheath Hill. We will leave the railway at this point – just before the train would have reached the first stop – Blackheath Hill, returning to the line to take it on to its final destination of Nunhead next week. Most of the black and white photographs come from Greenwich Photo History Wiki and are able to be used for non-commercial purposes such as Running Past, the exception to this is the photograph of the front of the station which was from eBay in September 2016. The map is on a creative commons via the National Library of Scotland. This entry was posted in Greenwich History and tagged Blackheath Hill, Blackheath Hill Station, Circus Street, Greenwich Park Branch, Greenwich Park Station, Royal Hill on October 12, 2017 by Paul B. 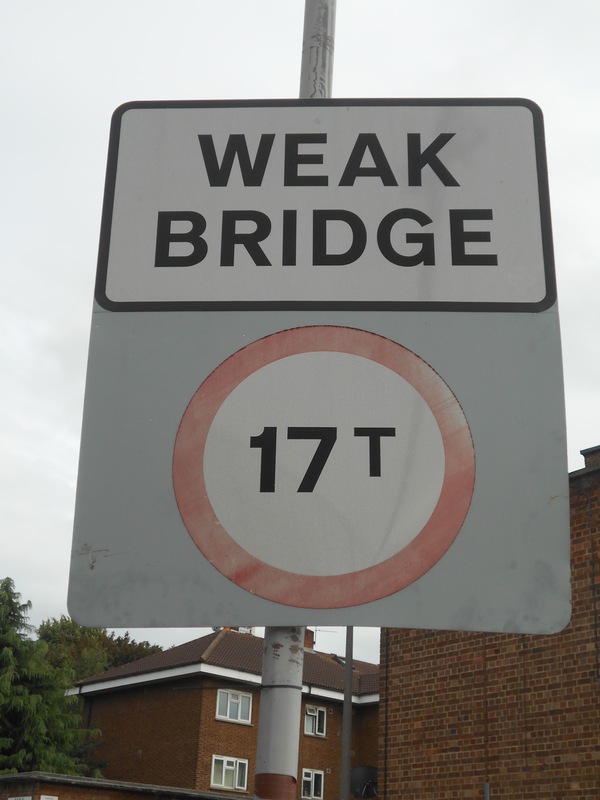 The sign for the weak bridge in Lindsell street I’m sure indicates that there is still a bridge below the road, the road being pre railway, this was not an open cutting. Further to this I have been within the arched shoot covered tunnel within 200 mts of this point and traveled 100 mts towards Greenwich Park Station. Brickwork piers can still be seen at the end of Burney Street which formed the start of tunnel under Royal Hill . Interesting – although are you sure about that section not being an open cutting? 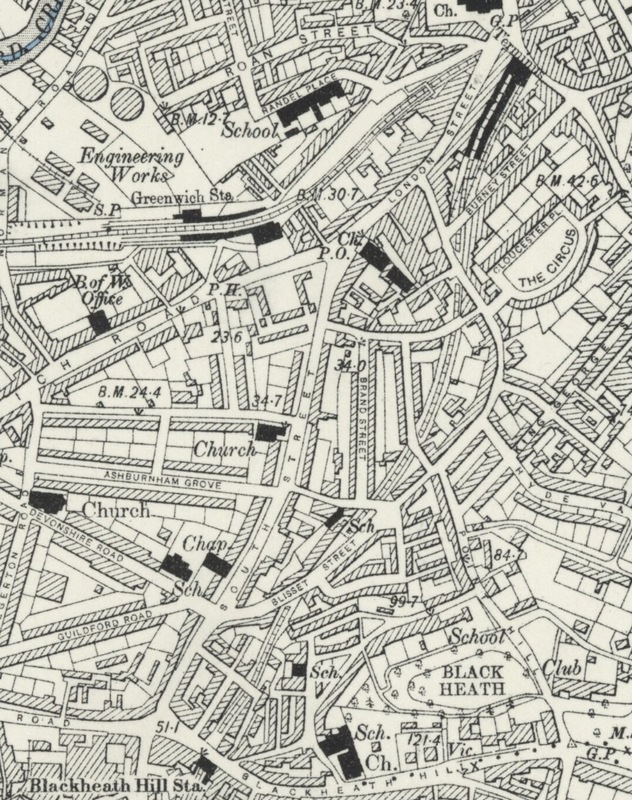 The photos of around Blackheath Hill & the map appear to suggest otherwise. Either way I am sure you are right about the bridge being post railway – it wasn’t there before as the 1860s surveyed OS linked below shows, and the void not being filled would make sense. Clearly I need to revisit Burney Street…. Thanks for visiting & commenting Bob, it is always great to get some more detailed knowledge. Did the branch go to Lewisham? 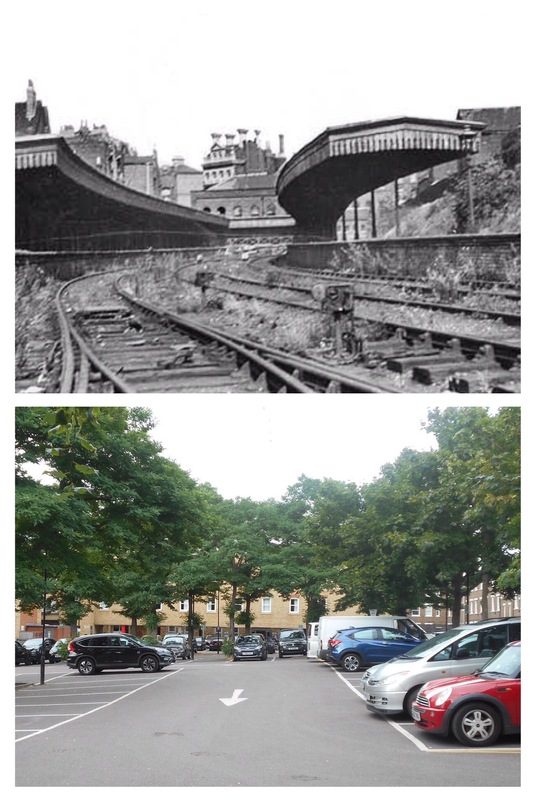 As you go towards New Cross from Lewisham town centre, a little way up Loampit Vale, in a little road on the right which may now not be there, you could see the remains of a railway – that was in about 1960, so nothing to do with Beeching. My Dad was born in Blissett Street, and he didn’t ever know about the line under the road. Although the family moved to Deptford when he was very young, his grandfather had a lino shop in Greenwich South Street so it was always a familiar area to him. Also interesting to see the engineering works in Norman Street, it may not be the same factory but Dad worked there at National Enamels for about 10 years, leaving in 1958. So lots of interest in this for me! Thanks for sharing it. Thanks for ‘visiting’! The rest of the line will be covered in a post next week. It did go towards Lewisham crossing Lewisham Way close to Tyrwhitt Road. Thanks Mary – pass my regards onto ‘Edith’, it is one of my favourite sites. Someone suggested on FB that there is still evidence at the bridge at that point, so at some stage I will go back to check. I didn’t see that article, it would have probably spurred me on had I seen it – I like a challenge. Thanks for the ckind comment – much appreciated. I’ll probably post the 2nd part next weekend.